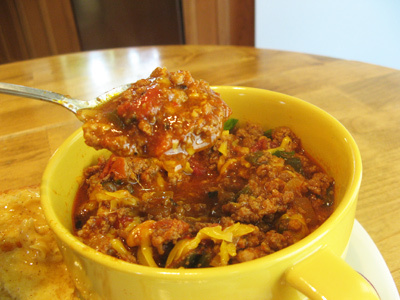 Chili is one of those versatile foods that goes beyond your hearty bowl of chili. You can make a number of meals just by changing it up. Add some beans and it’s easy to make a Taco Salad, top your favorite hot dog with cheese and onion and you have a Coney Dog, bake some tater tots or oven fries and you could have Chili Cheese Fries and don’t forget the Frito Pie. 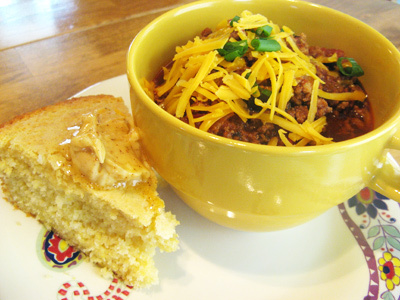 There are just so many good things to do with chili. And everyone seems to have a preference when it comes to spice and whether to add beans or not. I like beans in my chili but Joe does not, so I usually don’t put them in the pot of chili, but rather have some on hand to add to my own bowl. 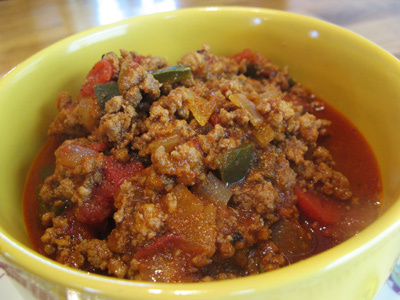 This chili is flavorful but not a hot spicy chili. If you need the heat, add some hotter chili powder and it will definitely spice it up. And lets not forget the sweet cornbread with ancho honey butter. I’m one of those girls who has to have her cornbread, it’s just not the same without it. Use your favorite chili powder or grind your own. 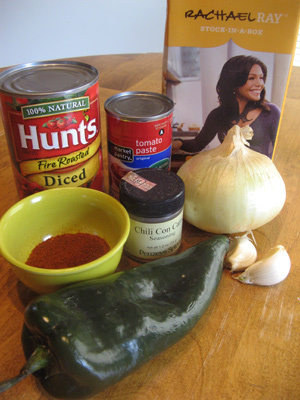 I used a variety of chiles that have the right amount of heat and flavor for my chili. 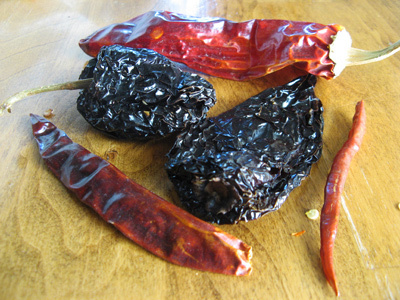 I used a couple Ancho, NM Red Chile, Chile Puya and Chile de Arbol. If you like it spicier, add more of the Chili de Arbol, they have more heat. I assembled together my ground chile powder plus Penzey’s Chili Con Carne, a mild spice blend of chili peppers, cumin, garlic, oregano, coriander, onion, red and green bell peppers, allspice, cilantro and cloves. Also an onion, some garlic, fire roasted tomatoes, tomato paste, chicken stock and a poblano chile. 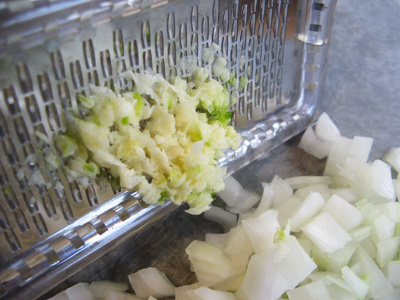 I chopped the onion and ran the garlic through a microplane hand grater. Sometimes I roast the poblano first, but I was in a crunch for time so I just diced it up. I started to brown a pound of ground beef and a pound of ground pork. Once it begins to brown throw in the onions, garlic and poblano pepper. 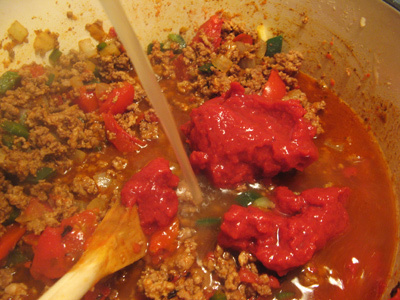 Next add 2 tablespoon of the chili con carne and 1 1/2 tablespoon of the ground chile, and a little salt, about 1/2 teaspoon. Stir it together and add your can of fire roasted tomatoes. Add 1 cup of chicken stock and 1/2 can tomato paste to thicken. Cover the pot and simmer on low heat for 30 minutes to 1 hour. 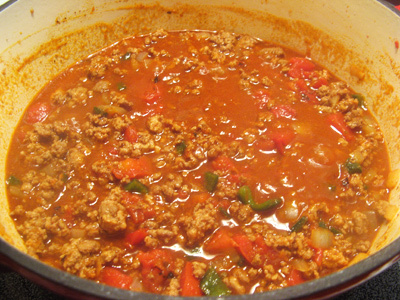 The longer you simmer, the more flavorful the chili will be. While the chili is simmering on the stove, I’m getting the dry ingredients together for the sweet cornbread. You’ll need some flour, cornmeal, salt, sugar and baking powder. 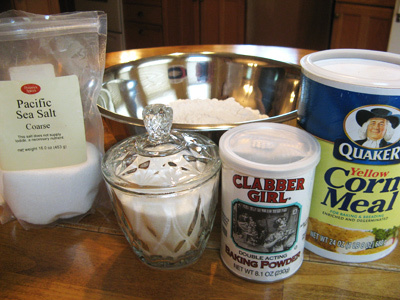 Mix together 1 1/2 cups flour, 2/3 cups sugar, 1/2 cup cornmeal, 1 tablespoon baking powder and 1/2 teaspoons salt together in a large mixing bowl. 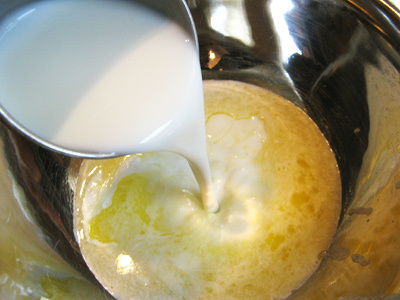 The wet ingredients include melted butter, buttermilk and eggs. 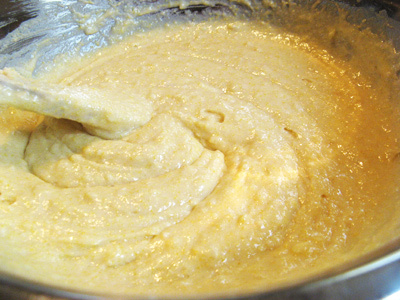 Melt 1/3 cup butter and pour into a large bowl. Add 1 1/4 cups butermilk. 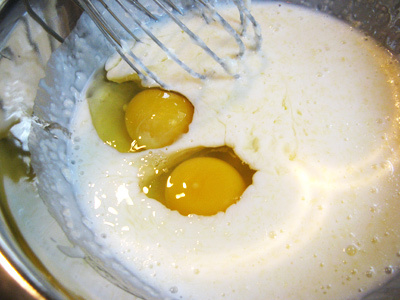 Add 2 large eggs and whisk together. 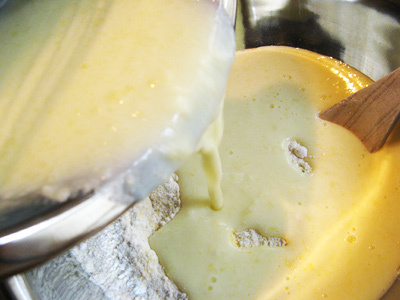 Pour the buttermilk mixture into the dry ingredients and stir until just blended. Preheat oven to 350 and pour batter into a 9inch cast iron skillet or 9 X 9 inch baking pan. Spray the skillet or pan with cooking spray before pouring the batter. Bake for 35 minutes or until toothpick comes out clean. 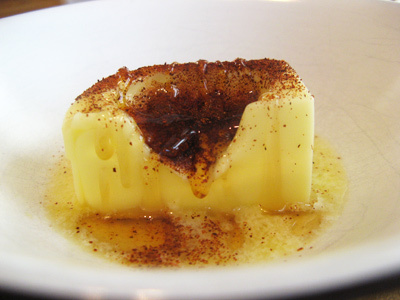 To make the ancho honey butter, take 1/4 cup or 1/2 stick of butter and melt in microwave on high for 20 second intervals (probably 40 seconds altogether) until your butter starts to melt in the center. Sprinkle 1/4 teaspoon ancho chile powder and 1 tablespoon honey over the slightly melted butter. Using a small wire whisk, whip butter into a soft creamy butter. 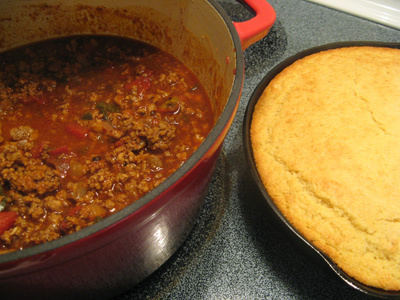 The chili is ready and the cornbread just came out of the oven. 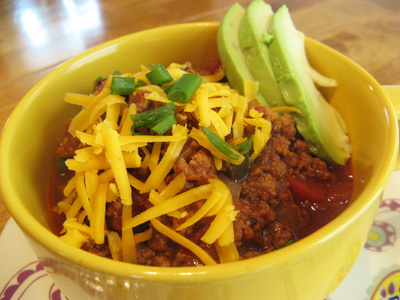 Ladle the chili into your favorite bowl. Can you see all the flavors in that bowl? Top with your favorite toppings. I had cheddar cheese, slice green onion and some avocado slices on hand. And make sure you get a big hunk of sweet cornbread with ancho honey butter to go on the side. 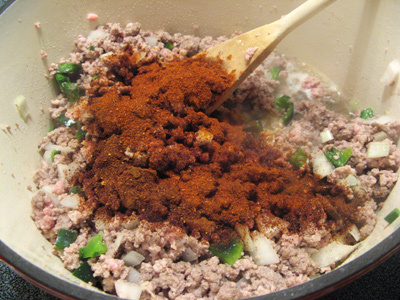 Brown ground beef and ground pork in a dutch oven or stock pot over medium high heat. 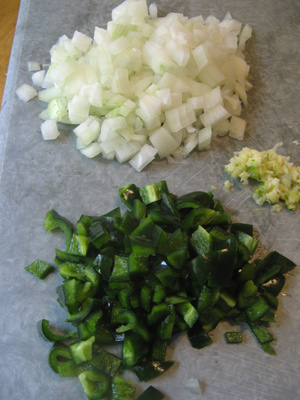 Add diced onion, grated garlic, and diced poblano pepper and stir, allowing veggies to sweat it out. 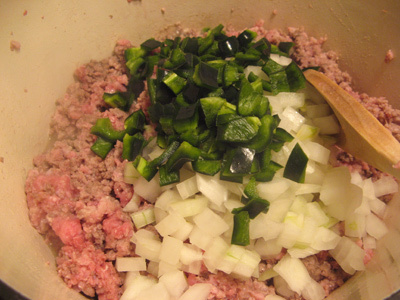 Measure out 2 tablespoons of Chili Con Carne powder and 1 1/2 tablespoons chili powder and add to meat mixture. 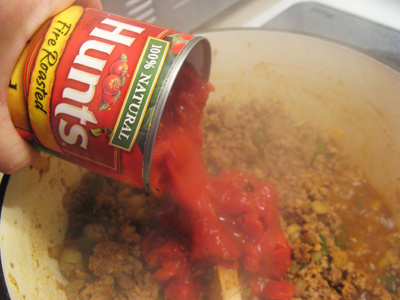 Pour in can of fire roasted tomatoes, 1/2 can tomato paste and 1 cup of chicken stock. Bring to a low boil, then cover pot and turn heat down to a low simmer. Simmer covered for 30 minutes to 1 hour. Top with cheese, green onion, avocado, sour cream or any favorite toppings. Preheat oven to 350 degrees. Coat a 9 inch cast iron skillet or baking pan with cooking spray. 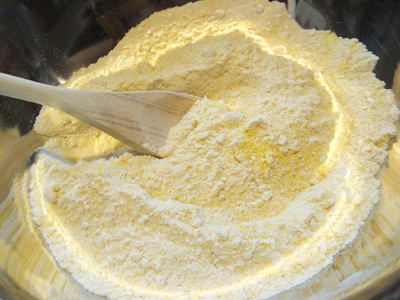 Combine flour, sugar, cornmeal, baking powder and salt in a large bowl. 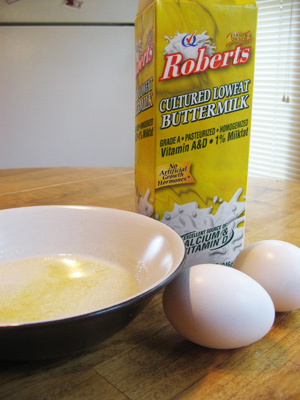 Combine buttermilk, eggs and melted butter in a bowl and whisk together. Add to flour mixture and stir until well blended. Pour into 9 inch cast iron skillet or 9 X 9 baking pan. Bake for 35 minutes or until toothpick comes out clean. 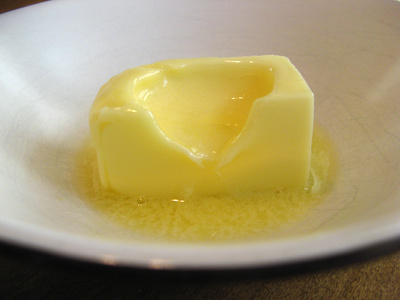 Place butter in a microwave safe container and heat on high for 20 seconds. Heat another 20 seconds until butter is slightly melted in center. 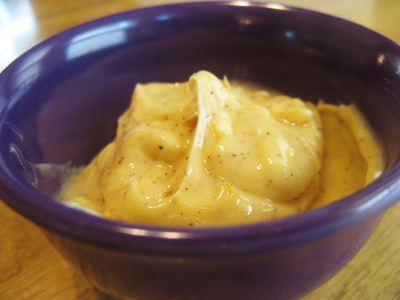 Add ancho chile powder and honey and whisk until butter is smooth and creamy. Serve with sweet buttermilk cornbread.